Every year I look forward to Victoria magazine’s Special French Issue. I find this year’s edition (May-June 2018) especially delightful. Not one, but two articles on living beautifully in Provence. Though you also find Paris and Normandy covered as well. Lots of good French-inspired decorating ideas in this issue. 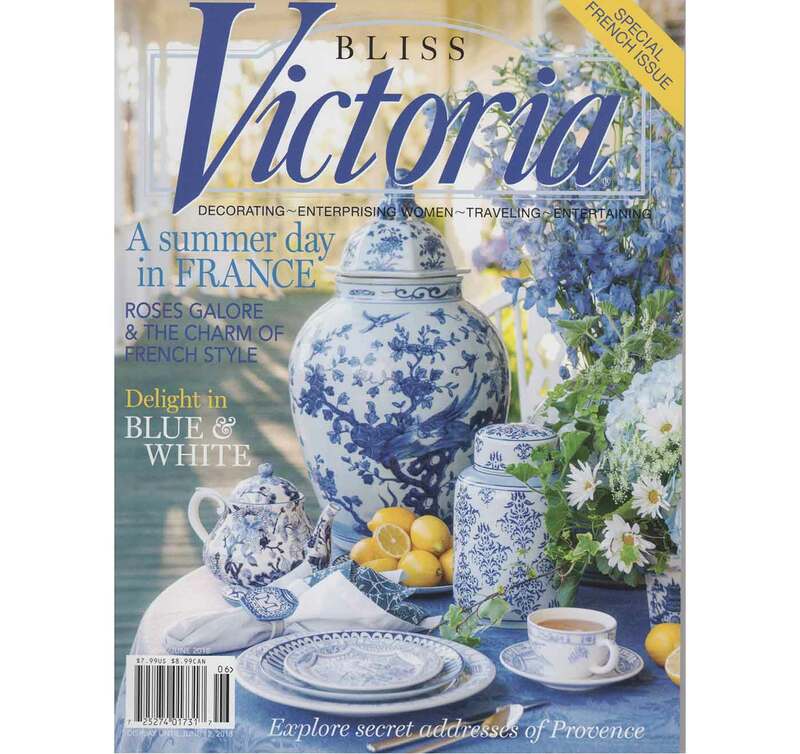 The magazine’s cover and a seven-page article Vive le Bleu et Blanc shows why a blue and white color scheme continues over the years to be so popular. My own blue and white pieces are displayed in two places in my house. First, on the wall next to the door between my little “Bistro Barone” (previously the breakfast nook) and the dining room, from just above the wainscoting to the ceiling hang five blue and white plates (originally from sets of hotel china) and one small blue and white antique bowl. 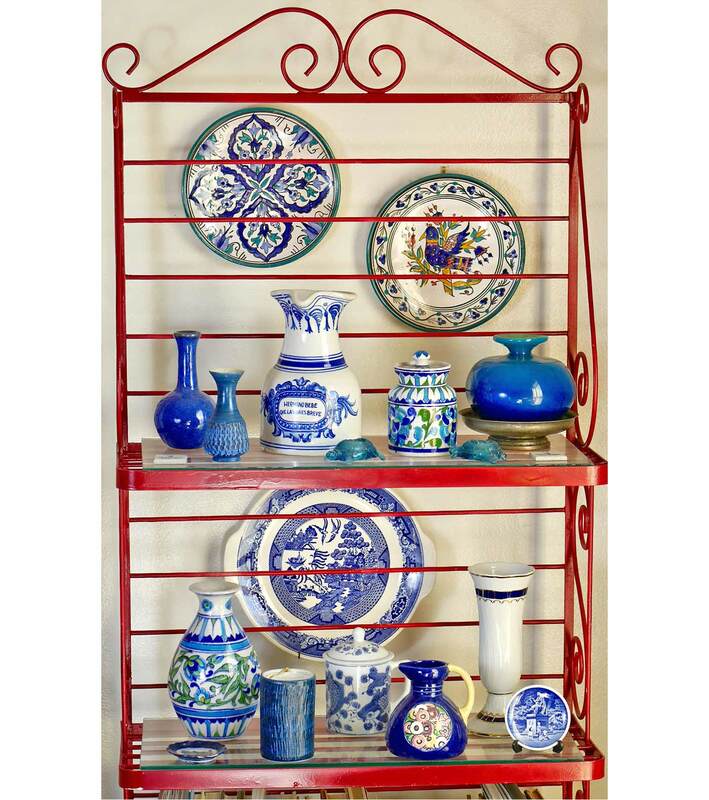 Second, the top two shelves of a baker’s shelf in a corner of the living room have more blue and white from a variety of locales. (see photo below) The two plates hanging above the top shelf are from Tunisia. On the top shelf, left to right, a handmade bud vase from Appalachia, a Maltese bud vase, a Spanish sangria pitcher, then a piece of Rajasthani “blue art pottery” from India and a hand-blown Maltese vase. 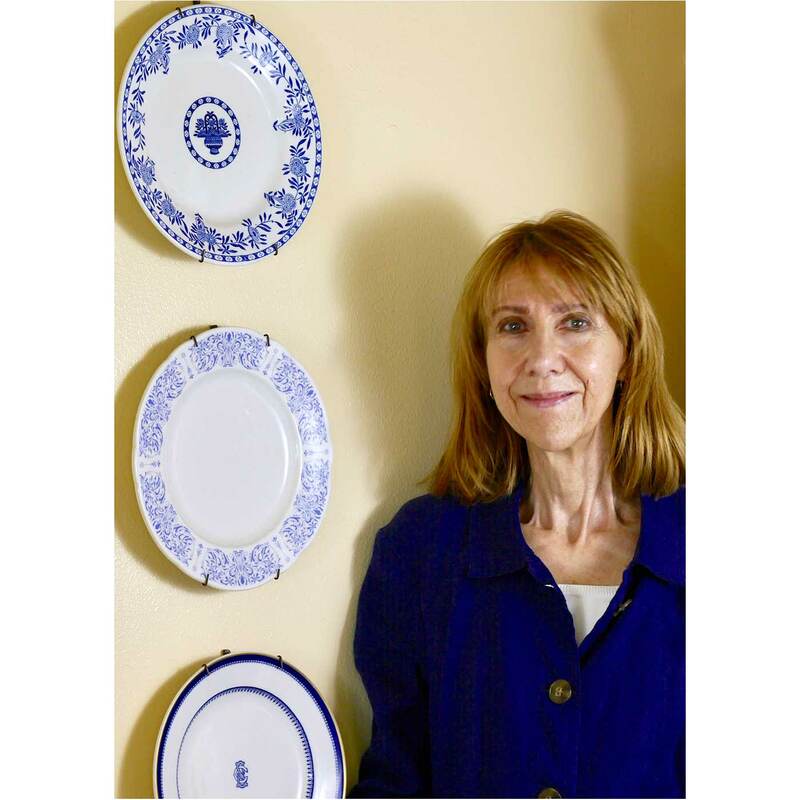 The plate on the wall above the second shelf is Blue Willow made in England. On the lower shelf, left to right is another Rajasthani “blue art pottery” vase. In front of the Rajasthani vase is antique pin dish showing the Carnegie Library in Paxton, Illinois. Made in Germany. Next comes a Maltese pottery drinking glass that I long used as a pencil holder, then a covered Chinese tea mug, next an antique milk jug from Czechoslovakia. The tall white vase was made by the same Hungarian company that made the china Laura Bush chose for the official White House china during the Bush administration. The small round plate is a souvenir that a friend of my mother brought her from Denmark. It shows the statue of Hans Christian Andersen known for his beloved fairy tales. Victoria’s Special French issue also has recipes for delightful French desserts. But Victoria’s recipes are so much work to make that I always just look at the photos and imagine how delicious these creations surely taste. Saves time and effort — and I consume fewer calories that way too. A lovely Victoria Special French Issue.